There are those that say winemaking is an art, but in truth, making the wine is a relatively simplistic process as it just comes down to letting grape juice ferment. 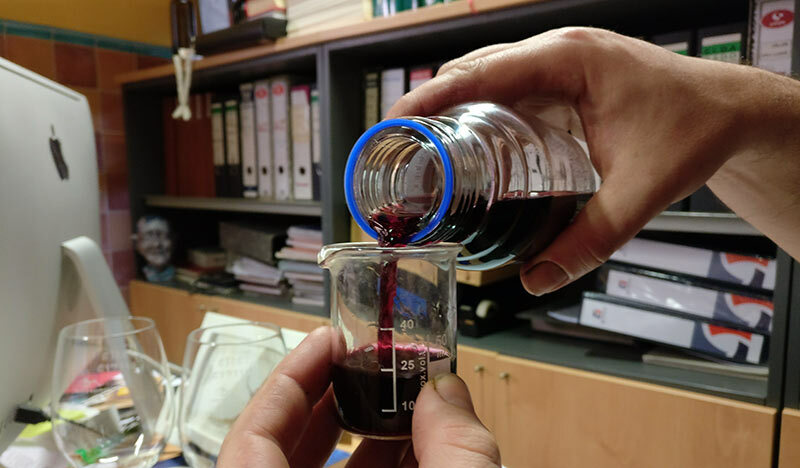 Sure, there are many more detailed facets to it than that, but they pale in comparison to where the actual art of winemaking lies: the blending. Ever wonder why wines that achieve massive scores are often single barrel wines? It’s because the minute you start mixing, Awesome Barrel #1 with Awesome Barrel #2, not to mention Awesome Barrels #3-105 that the wine will start to fight with itself. One barrel’s aromatic elements may trounce another’s or then when two certain barrels are mixed, what were great tannins in each become unbearable cat scratch tannins together. To balance all of this out is indeed the art and you really need to know what you’re doing to make the wine taste good not just now, but potentially in five or 10 years from now. And, this doesn’t just apply to wine from oak barrels, but also steel tanks, concrete vats, and anywhere you need to piece together a wine from separate parts. It’s actually one of the items I mention in the new Georgian wine book as a potential problem for kvevri producers as due to increased production, they’re just now starting to deal with the give and take that masterful blending of a wine requires. My friend Albert Costa of Vall Llach invited me over one day when they were working on the initial blends for their Vi de Finca wine, Mas de la Rosa 2015. This is a 100% Carignan wine from a vineyard of very old vines up on a hill above the village. We tasted through the 10 different barrels currently sitting in the cellar to decide on about five or six to go into the final blend and give the limited 1,500 or bottles of this wine. There were barrels of different ages, makes, toasting levels, and then added into this is that the vineyard has two distinct parts (barrels 1-6 are the first part and 7-10 the second) that then need to be smoothed together. So what follows is a very geeky rundown of all the barrel tasting notes which, if one is inclined to read such things is very illuminating. Note that the years are the first year of use. Violet, big red fruit, cedar toast. Very fruity, lightly spicy, medium intensity, peppery. Very “planky” and two dimensional in aromas, dark fruit, licorice, opens well, well-developed in the mouth, blackberry and juicy. Plum, violet, nervy, wet stone minerality, citrics in the mouth, orange peel, chocolate powder. Potent barrel that overall masks the vineyard traits however. Fine raisin, plum notes, rich, layered, butter, full, ripe in the mouth with a finish for days. Long-lived, full yet elegant tannins, cocoa, plum, wine to age for years. Red and dark fruit, but lacking in intensity. Fine but light. Balanced in the mouth, again lacking the intensity but more elegant. Fine finish. Racy red fruit, raspberry, alcohol predominant initially, little mossy, earthy. Stony, mineral, dark fruit in the mouth with a medium minus finish. Really carrying forth the 2014 vintage aspects. Bit closed, mineral notes, prunes, very very potent in the nose. In the mouth, dusty tannins, spicy with a medium finish. Chocolate, herbs de Provence, toasted almond, jammy red fruit, ripe red cherry, very forceful at first. Very round in the mouth, elegant, long finish, extremely attractive in the mouth. Again, carries the notes of the 2014 vintage. Mossy, forest floor, dark fruit, dark cherry. Bit closed in the mouth, medium minus finish, good tannins but short. Red fruit, rose petal, raspberry, toasted strawberries. Lighter in body with a bit of volatile acidity in the medium finish. So taking this all into account, what did Albert, his enologist Jordi, and myself come up with? A blend of 2,4,6,8,9 and then 100l (basically half) of 7. Dark fruit, layered, bit of chocolate. In the mouth very well-balanced, red fruit more persistent, touch of VA in the finish. Ultimately, this will probably not be the final blend and it will be tweaked a bit more and analyzed again in order to arrive at the final, seamless blend. Regardless, it was an interesting exercise and the final wine that people will find on the shelves in another year or so will be even more different than what we tasted. All just part of the “art” of winemaking. Good wine is really a science. I bought a bottle of Mas de la Rosa 2013 early this year. Do you know if it’s ok to drink or should I wait a few more years until it evolves? The wines from 2013 have that unenviable quality of being ready to drink now or then able to be aged for years. Starting now in 2017, they are coming in to their peak time however which will probably carry until 2022 or even more depending on the wine. It’s quite possible we’ll be opening them in 2033 and still quite pleased with them but in no way would I expect anyone to wait so long as they’re so tasty now and most wineries have already sold out their inventory. How did you end up assessing the blend? I assume it is not just a matter of simply tasting the ingredients and decide that they will go well together, but also of effectively blending the wine and tasting the end result. Were there are a lot of differences or surprises you discovered then? It’s a lot of trial and error and Albert and Jordi have many vintages under their belt to have a good idea of what will work and not. Basically, we decided which barrels were our picks and then made a “mini blend” out of them which is actually what the lead photo is from. We tried that and weren’t sold on it and so we tried again. They will go on and try additional blends before finally bottling it, honing down the exact mix as there of course no do-overs. The main surprises where how marked the barrels that had started in 2014 were with notes from 2014. That and how insanely dominant Radoux is. I’d never use those barrels if I was given the option which I why I think there’s just one in the series at the moment. Thanks for the comment, I can imagine that the experience to properly determine what components to use in the final blend is hefty. I tasted through the base wines with Benoit Tarlant ones, and he was at the time also experimenting with different coopers, and just like you, I was surprised by the diversity in taste and texture that a different barrel could impart on a wine from the same vintage and same parcel.